The UN climate science panel’s job is to write a scary report before the UN holds its next big climate conference this December in Poland. Yet global weather, extreme or otherwise, is normal. Sea level continues to fluctuate at the same tiny pace it did since before the industrial revolution. Temperature observations consistently come in lower than computer models predict. Polar bears keep on thriving (sorry seals). What’s an alarmist to do? 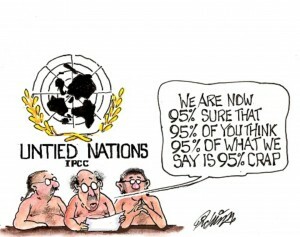 That’s exactly what the UN International Panel on Climate Change (IPCC) just did. They issued a new “climate tipping point” this time giving us only 12 years to make “unprecedented changes in all aspects of society” before their dire predictions finally come true. Do you think this tipping point is more accurate than the many that have already come and gone without harm? Marc posted a vast history of past tipping points at Climate Depot. They’d be funny if they weren’t dangerous. In other words, fork over your finances and freedom to Gore and company and everything will be alright. Does anyone really think wrecking our economy by funneling trillions of dollars to Gore’s friends through the UN would be a sound idea?